The Olympic marathoner's role as brand ambassador made all the difference. If you've ever owned a pair of Skechers, it's probably because you're into the hip style of the company's street shoes. The Manhattan Beach, Calif.-based brand has carved out a sizable niche in the casual footwear market ever since it was founded in 1992 by Robert Greenberg. But times are changing for Skechers. Thanks in large part to its decision to feature U.S. Olympic marathon silver medalist Meb Keflezighi as its brand ambassador, Skechers is now making inroads selling performance shoes -- despite being a relative newcomer to the field. Keflezighi, an Eritrean-refugee-turned-American-record holder, has been instrumental in elevating Skechers Performance and its GOrun model into the award-winning line that it is today. A brand that once had zero credibility in athletics is suddenly competing on the same playing field as Nike, Adidas and Reebok. We recently talked with Skechers Director of Sports Marketing George Van Cott, who told us how it happened. How did you guys come up with the idea of bringing in Meb as your brand ambassador? My former boss, Jennifer Weiderman, was the first one to bring up Meb's name when we were getting into the performance category. Her knowledge of Meb and his story and his being an Olympian was what brought it to our attention originally. So we started sending him shoes at the end of 2010 and he started to run in them. He ran in them for quite a while and performed well. We knew he held a lot of weight in the running world, that his story was a good one and that he was underappreciated by the mainstream. So we thought he'd be a great ambassador for us. What was it about Meb that made him a good fit for your attempt to gain market share in performance shoes? It was more of an underdog fit at the time due to Meb's age and the injuries he endured. Like most athletes, Meb has had a lot of challenges and has accomplished things people said he couldn't do. With Skechers performance, it's also been a challenge for us since the beginning to be taken seriously. But the credibility he brought with him sped up our credibility. He has helped us to maintain that credibility, too. Were there any advantages to being such a late entry in the performance shoe market? There's definitely been an advantage from not being in the performance field for a long time. I think it's harder for other shoe companies who've been doing it for a long time. They have a way of doing things now. But since we are new, we don't have to follow a certain mold. We can be on the outside and do things a certain way and not break tradition. Once you had Meb in the fold, what was your strategy for using him as your brand ambassador? The marketing side of it was thinking "Let's build this all around Meb." As opposed to other companies that have several athletes, he was our only one. So we knew we could put all our marketing efforts behind him and launch around him. We signed him in August of 2011, and our GORun shoe came out in October and by November he was running in the New York marathon, so it was great timing. We have let Meb lead the way and we've done whatever we can do to expand the awareness around him. Building his brand has helped build our brand. How important was his appearance in the 2012 Olympics for Skechers? It was great. We've been calling him America's No. 1 marathoner since then. We all followed him so intently. Our team has had so much fun rooting for him, especially a lot of us who weren't really marathon buffs before. It started in New York when he ran a personal best (PR) in our shoes. When he ran another PR again in Houston at the Olympic trials, it brought more and more credibility to our shoes. He was striking more on mid-foot because of our shoes, according to the analysis of his running motion. This validated everything we were doing since he was age 36 at the time and yet was running faster than he ever had. It's pretty rare for a distance runner to become the face of a shoe brand. In track and field, it's mostly sprinters who get the love. Were you worried that he might be too obscure of an athlete to sign? I think it was agreed he was the best possible athlete we could bring on. I don't think there was any disagreements within the company. Runners can relate more to a guy like Meb. There's so many people running right now, so it's much easier to relate to a guy who is doing something you are doing. Usain Bolt might be a great ambassador for Puma but how many people are wearing his track spikes? For us, it's a much more grassroots feeling. Average runners really respect a guy who can run a sub 2:10 marathon. Combine all that with his personality and his story and its a perfect fit. The sky was the limit with Meb. He's proven it. He still runs at a high level and is still America's No. 1 marathoner. What part of your marketing strategy with Meb has made the most impact for Skechers and what are you most proud of? Probably the vertical platforms we've put him on. You've seen two TV commercials, plus all the billboards and he also shows up to talk to fans at events. We've combined all those things: TV, outdoor, print and appearances into one nice platform. We've expanded his brand and a lot more people know him now than they did before. I think the thing I take pride in most is we really let him lead the way and we've built everything around him. Seeing him at an event where he's meeting his fans and seeing how many fans he has is amazing. He'll literally talk to every single person. He's really appreciative of everything he has. But I'm probably most proud of being friends with the guy. 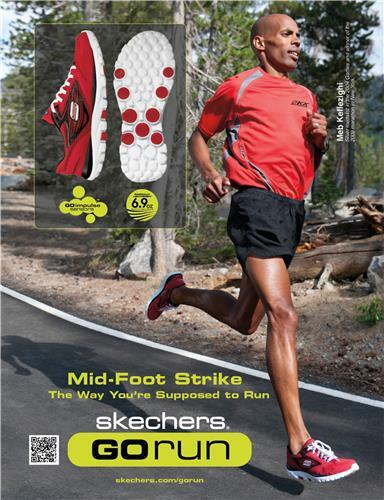 Now that Meb has helped you gain a beachhead in performance wear, what's next for Skechers? And where do you see your relationship with him heading in the future? We're on the lookout for another distance road runner. We'd like another athlete similar to Meb as far as where they are in their career. We've resisted the temptation to sign a lot of middle-of-the-pack guys. One Meb is worth so many other people. We plan on riding him all the way through to the 2016 Olympics. We joked about going to Rio after the 2012 Olympics but now it's more of a reality since the competition isn't there as much on the men's side. We're signed with him through 2016 and I expect our relationship to go beyond his running career. It's our hope he becomes our Godfather to the Skechers performance brand.